Description: Wingspan 45-62mm. Adults are quite distinctive and have an overall mottled appearance, which is mainly white peppered with black. The amount of speckling varies between individuals. The body is quite hairy and heavily marked. Males have large comb-like antennae. Flight Period: From early May to late August with some individuals persisting into September. Status: Common and widespread throughout all counties including Rathlin Island. Ecology: A late spring species related to the Oak Beauty B. strataria, but more commonly encountered across a wide variety of habitats including gardens. Adults come regularly to light in small numbers. 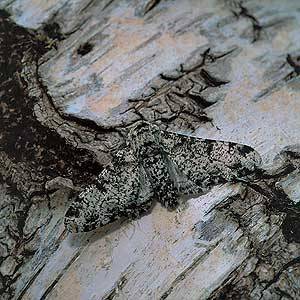 It is occasionally seen by day at rest on stonewalls and tree trunks, where it can be incredibly cryptic among lichens. The melanic form carbonaria has been recorded from a variety of sites throughout its range in N. Ireland at Cushendun, and Aghalee Antrim, Belfast and Newcastle Down. The larvae are frequently encountered from mid-summer onwards on a variety of trees including, willow Salix spp.., birch Betula spp., Hawthorn Crataegus monogyna, oak Quercus spp. and possibly others. It overwinters in the pupal stage. World Distribution: Central and southern Europe and also N. Africa.